Star Wars: The Black Series! The 6-inch line showed very little you hadn't seen (or seen hinted at) before. The presentation had Doctor Aphra and her droids, plus the previously seen Chopper and Ezra Bridger. More surprising were 20th Anniversary Episode I "vintage" packaging for Celebration in Chicago. Today's 3 3/4-inch Stormtrooper Squad Leader is at a Target near you now, and probably marked down a few bucks. It has a wonderful sculpt and sharp detailing, making it a great army builder if Hasbro ever decides to release it solo. (See what I did there?) Anyway, get one. Read on! Ad: The first 6-inch international exclusive is available in the USA at Entertainment Earth! 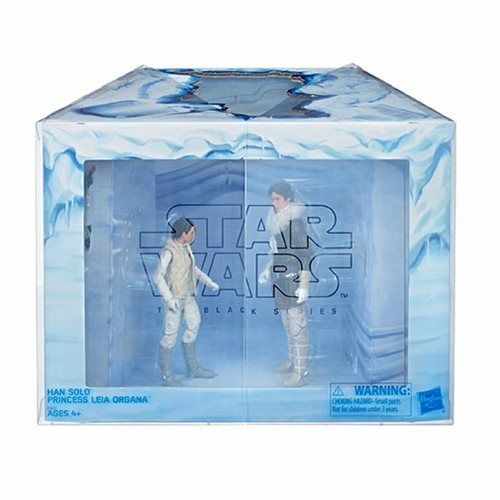 Order the Star Wars The Black Series Hoth Princess Leia Organa and Han Solo 6-Inch Action Figures - Exclusive today! A limited quantity are available for the US market, and when they're gone they're gone! Order yours here. Forces of Destiny had a lot going for it - much of which may never see the light of day. New episodes keep streaming, but new toys are far and few between. 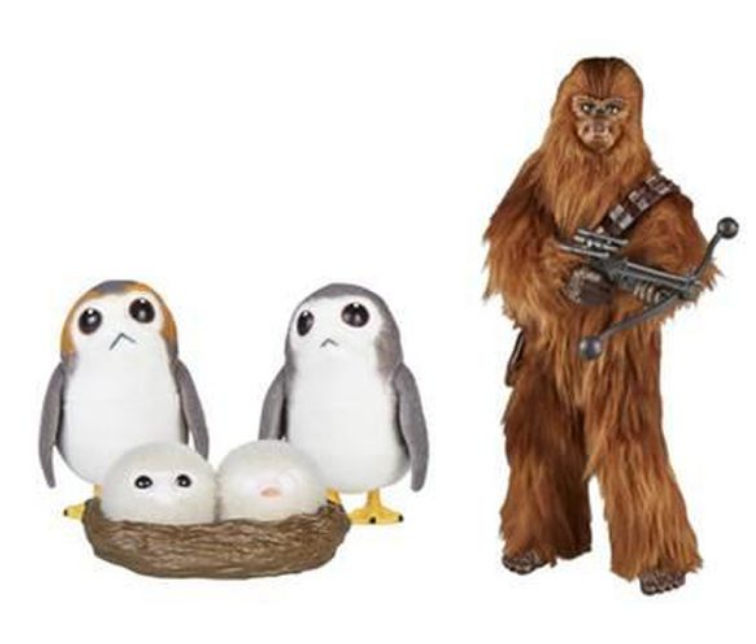 The Porgs with Chewbacca got far enough along that you can snag yours at Comic-Con in a couple of weeks. Cnet has the scoop - Chewie can be bought today, but the whole set is $50 at the show. Read more here. 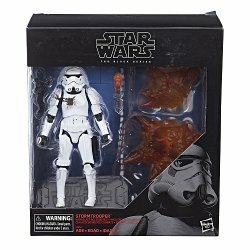 Toys R Us will survive in Canada, and they have this exclusive Stormtrooper. It's a lot like our other troopers with a stand and some flame accessories, and it's CAN$49.99. A standard figure is CAN$29.99, so it's $20 extra for two painted flame pieces, a new blaster, a couple of black paint splotches, and a grey display base. We'll post more about when or if this becomes available elsewhere. Getting through hundreds of images is time-consuming, so let's cheat. It's time for The Vintage Collection to return like so many seven-year locusts. Here are images from Hasbro's showroom, mixed in with lightly edited tweets from our livetweet Saturday afternoon. You'll see exclusives, main line items, and even a preview of something for 2019. Sound good? Awesome. 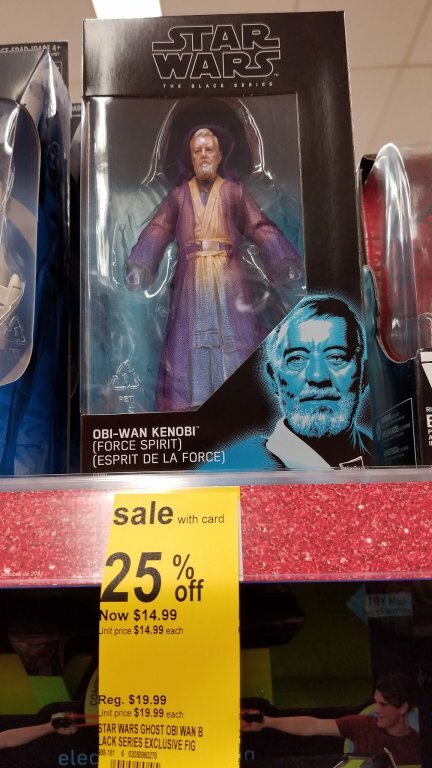 Walgreens Exclusive Spirit of Obi-Wan Already on Sale? The new Star Wars Obi-Wan Kenobi (Force Spirit) hit in September, and our pal Phil is already finding them for $14.99! I haven't even seen these in all stores in my area yet, but they are making the rounds. In most major cities you can throw a rock and hit a Walgreens, or two. If you're lucky you might also find some basic figures from the newer waves next to this Force Spirit. Happy hunting! Take a look at R5-S9 (Droid Factory), it's blue! The colors don't match the show perfectly, but it's also not an animated figure. You can find this The Clone Wars-inspired robot at Disney theme parks in a 4-pack, and of course we're going to look at them all. Read on! If you recall last year, Hasbro didn't announce its Jyn Erso exclusive until San Diego Comic-Con-goers were already on the ground. This year, we may (because it wasn't officially announced yet) be seeing this Star Wars: The Black Series Jedi Master Luke Skywalker and Jedi In Training Rey 2-pack as seen on the Jedi Insider today. It hasn't been officially announced at all, but it does look a lot like official Hasbro photography. More as we have it! If you're enjoying stomping the pavement to find R5-D4 at GameStops this weekend, good news - you can do it again in November! For a couple of bucks north of $20, the Imperial TIE Fighter Pilot variatnt Inferno Squadron Pilot should be up for grabs in November. It's like the TIE Fighter Pilot you have but with more red. The info just keeps rolling in! Hasbro's PR department informed us that Commander Gree is coming to Toys R Us as an exclusive. When? We don't know, but the 6-inch The Black Series figure looks pretty sharp. More information as we have it - and it's nice to see the prequels getting some love out there.